When we were in Tasmania during January, the weather decided to put on a bit of a show. There is not much between Tasmania and Antarctica but water and wind - and in the correct proportion those two ancient elements produce a third, rain. In abundance. Over one night we had some rather heavy rain - and by coincidence I had taken a picture of this small waterfall the day before. So, I made a second shot - not exactly from the same place, but close enough. When you walk on the hills in Tasmania you always need a full set of weatherproof kit - these pictures show you why! As ever, these picture look better bigger! 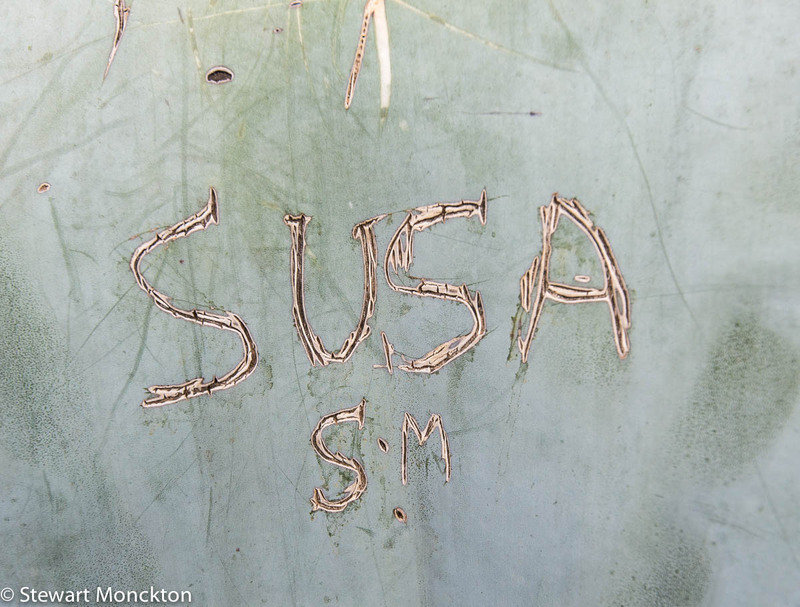 There are times when I really just don't get it - and the it in this case was writing your name and (presumably) initials on the leaf of a cactus / succulent plant in the Royal Botanic Gardens. I don't know if the initials caught my eye, but I found myself feeling rather cross! 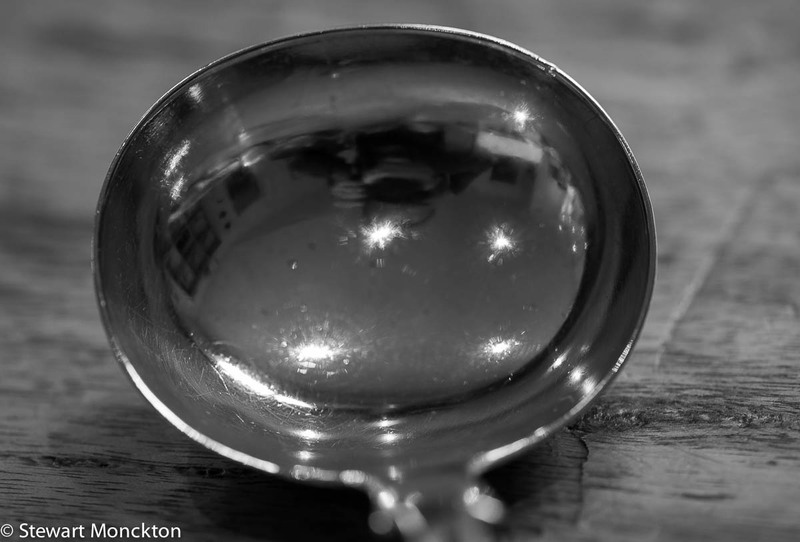 Having said that, it does make a rather interesting sort of image. As part of the build up to the Melbourne Grand Prix, there was a low level fly past by the Qantas jet. I just like the perspective of these images. I only had a wide angle lens with me - I was planning to take pictures of the worlds largest flower - but in the end the best camera is the one you have with you. These images do look a lot better bigger! 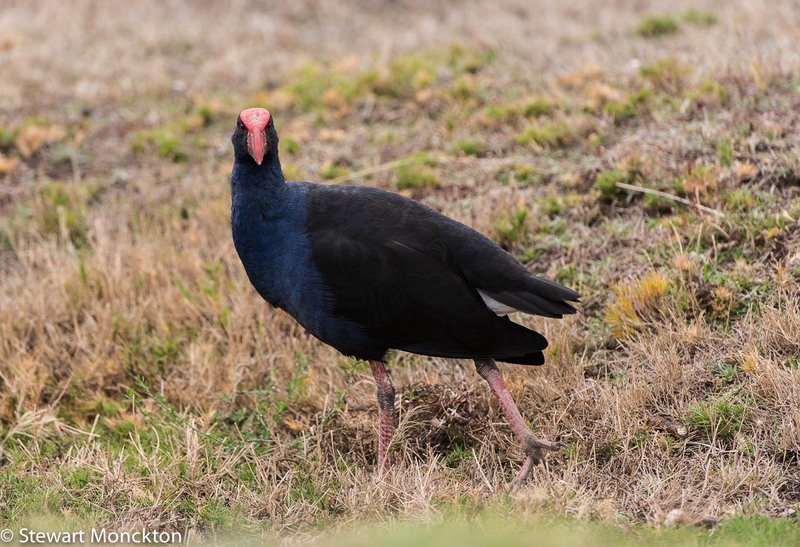 These are the last of my shots from my recent trip to Phillip Island and Churchill Island - the aim of the game was not really bird pictures, so I'm more the pleased with the the species I managed to get decent pictures of. 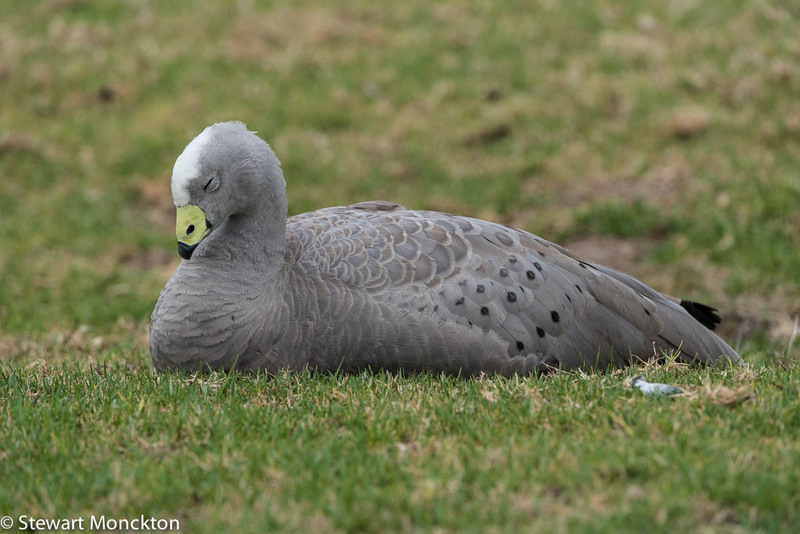 These birds are Cape Barren Geese - Cereopsis novaehollandiae, which means New Holland Wax Face. 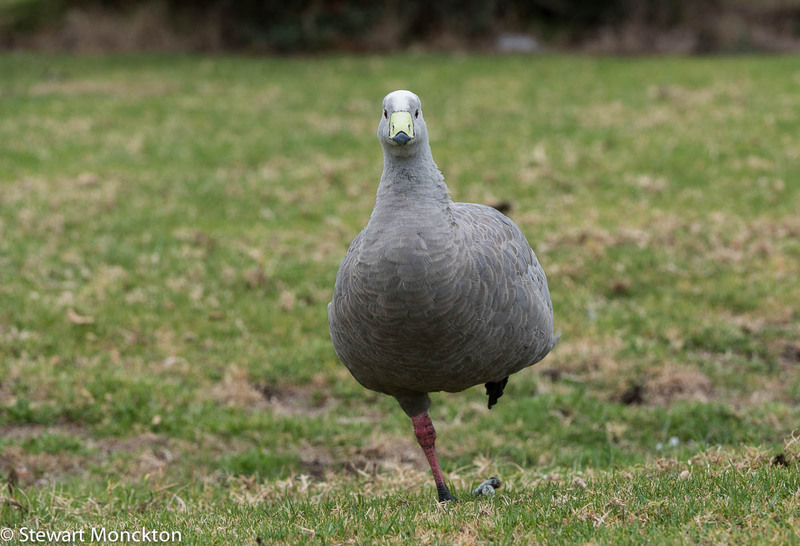 New Holland is an old name for Australia, and presumably the 'wax face' refers to the yellow around the beak. After a little shuffling along on my bum I was able to get pretty close to these birds - although I did end up with a damp rear as a result - oh, the sacrifice! I seem to be developing a bit of a style here - face on shots and birds going yoga! Hope you like these rather splendid birds. So now it's your turn. Click on the blue button and off you go. 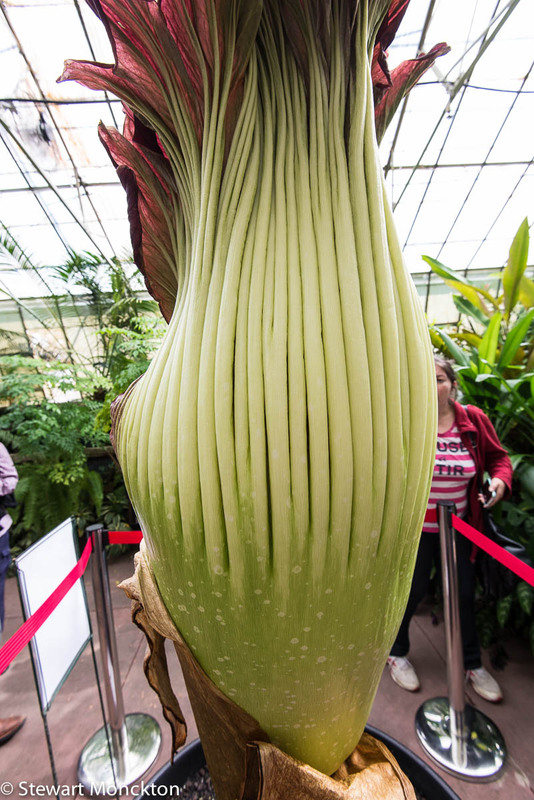 A little while ago, the largest flower in the world was in bloom in the Royal Botanic Gardens in Melbourne. Given that these plants only produce their huge every 7 to 10 years, I thought I'd go and have a look. Also, given that this flower attracts pollinators though its fouls smell, I though I'd go and have a sniff as well. 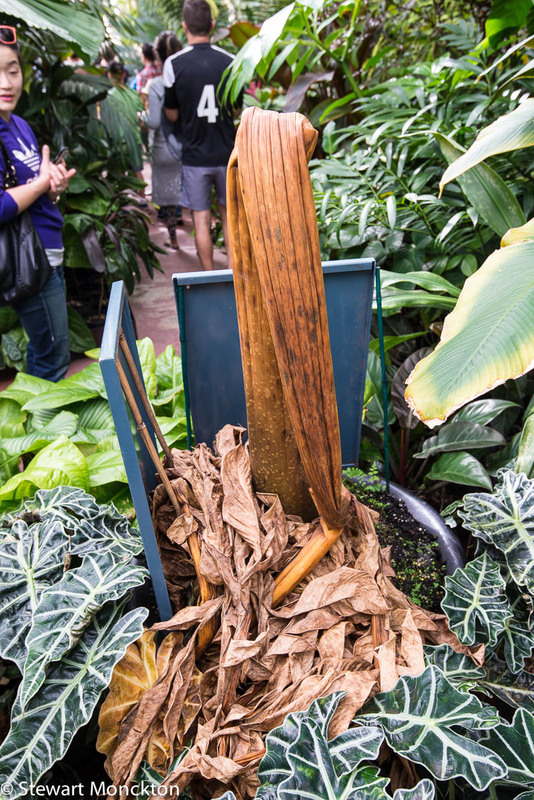 The flower goes by a number of names, including Amorphophallus titanium, the titan arum and because of its smell, the corpse flower! 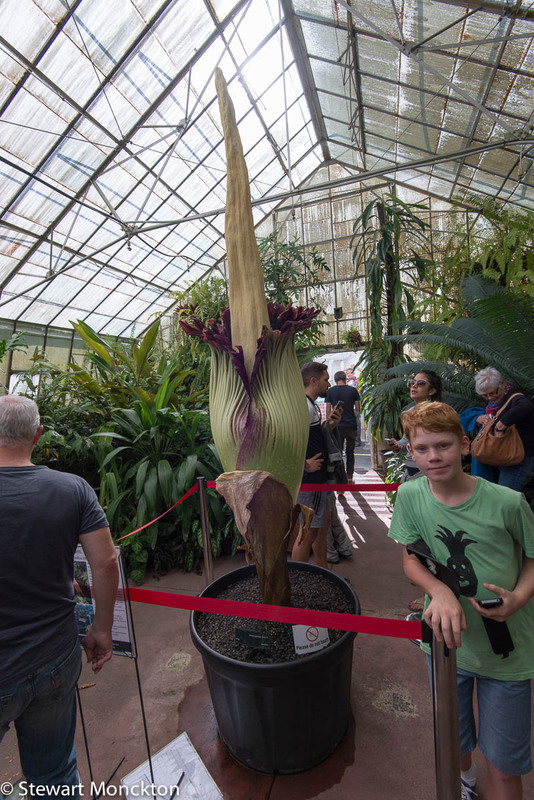 As you can see that flower is rather large, towering over a rather splendid looking boy who chose to wear a suitably botanical tee-shirt on that day! You can't smell the smell, and (possibly) thankfully neither could we! It seemed that the stink had subsided a bit by the time we got there. One of the staff told us that it was actually making her gag the day before! As with many plants the architecture of the whole thing is remarkable. These are some closer images of the plant. 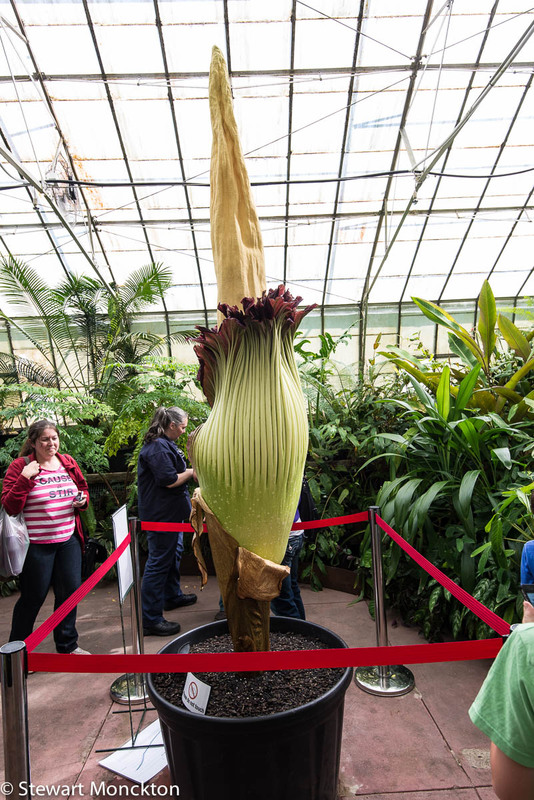 What is also remarkable is that the flower rapidly decays away after blooming - and only remains fully in flower for about three of four days. After that it rapidly collapses. This is a plant that was in flower a short while ago. If one of these plants comes into flower anywhere near you I would recommend you go and have a look. 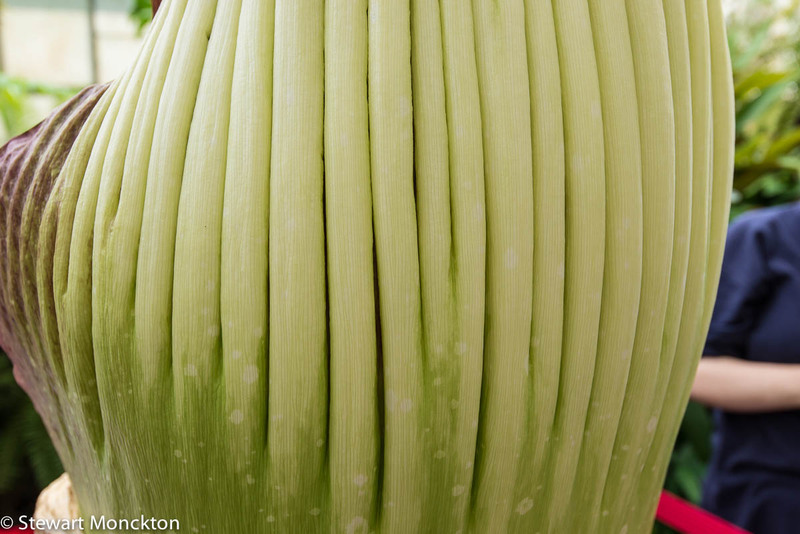 You can find out more about this plant at the modern repository of all knowledge. 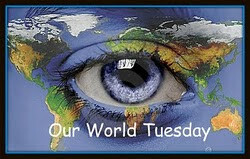 And you can find more images from around the world at Our World Tuesday. 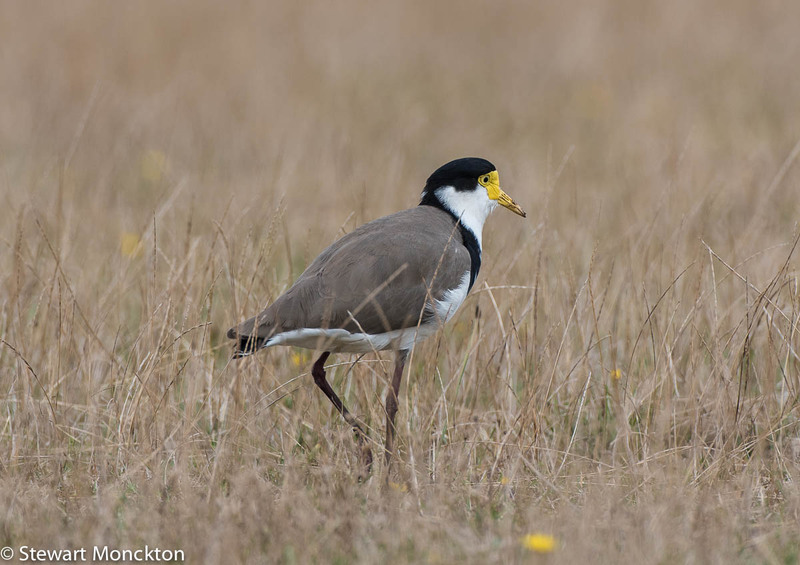 This is another bird from my recent trip to Churchill Island, and another set of pictures taken using the car as a hide. 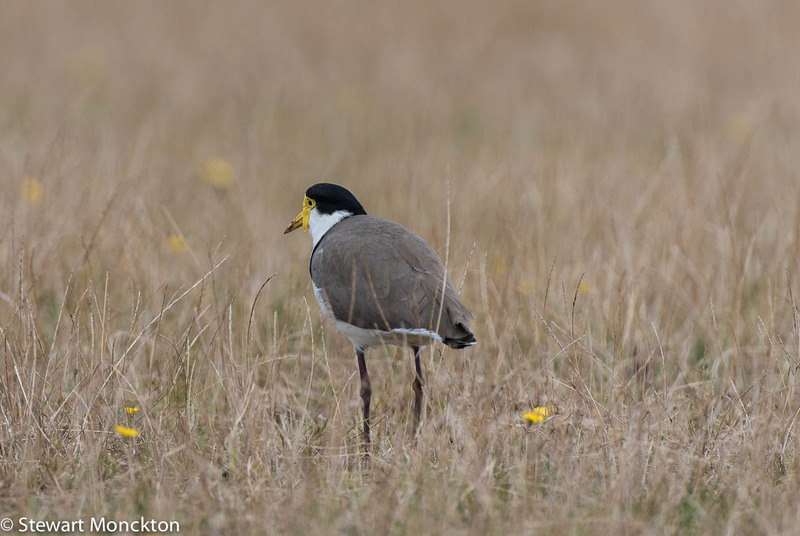 This bird is a Masked Lapwing - or Vanellus miles. 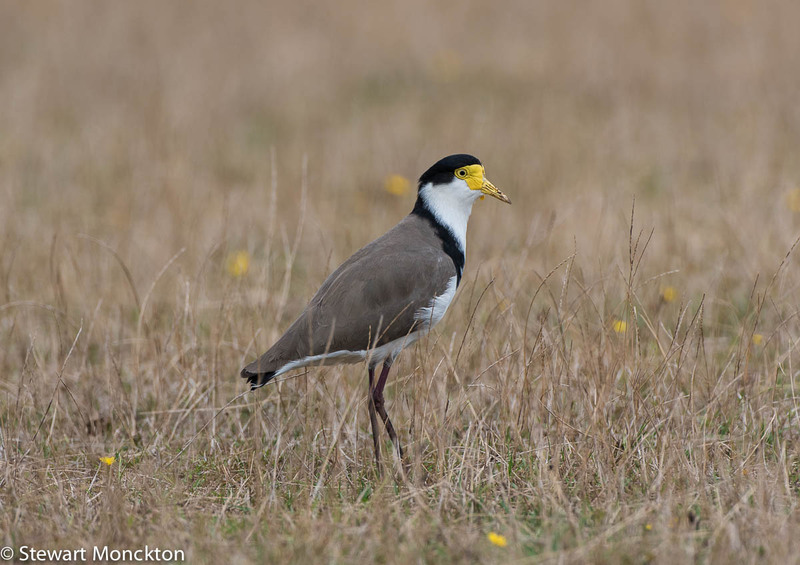 This individual is an example of the species of bird that used to be called "The Spurwing Plover", but has now been 'downgraded' to a race of the species V. miles. The yellow wattle that hangs from the face is flexible, and I think this one has the lower part of one of the wattles tucked up under the other. I have to say I really like the colour palette of these images. Now its your turn - click on the blue button below and off you go. 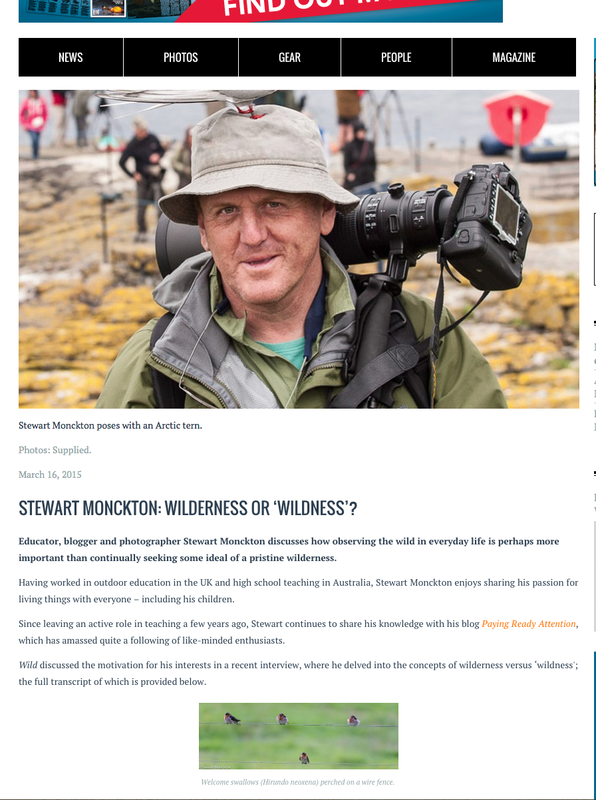 A while back I was contacted by an editor from Wild magazine in Australia (who also happened to be one of my former students!) about an interview for the magazine. Well, today the interview went live, as they say! 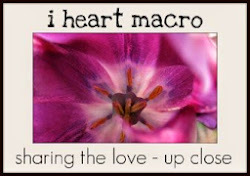 So, why not pop over and have a look at what I had to say! You can find the page here. While you are there why not leave a comment, so the good folks at Wild will know you have visited! I'm not sure if this bike is a fully authentic 'left behind' object - but even if it has been artfully placed, it's been there for a while. This bike was parked (abandoned?) outside one of the original houses in the Corinna township we stayed in during our trip to Tasmania. 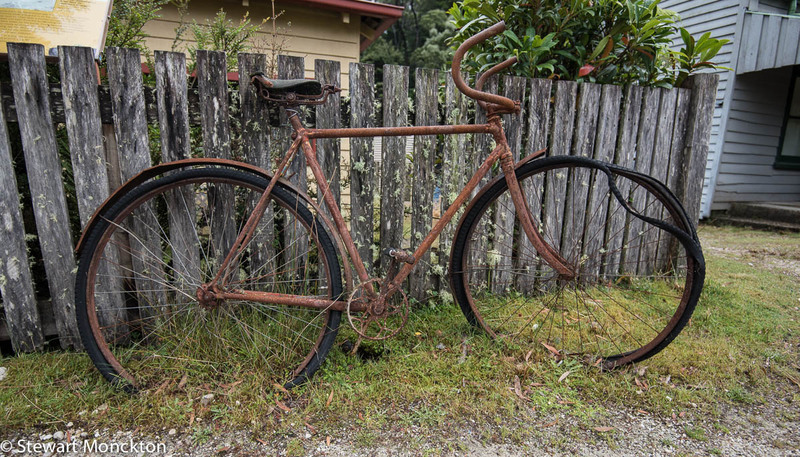 The amount of rust on the bike is a testament to the amount of rain the area receives. 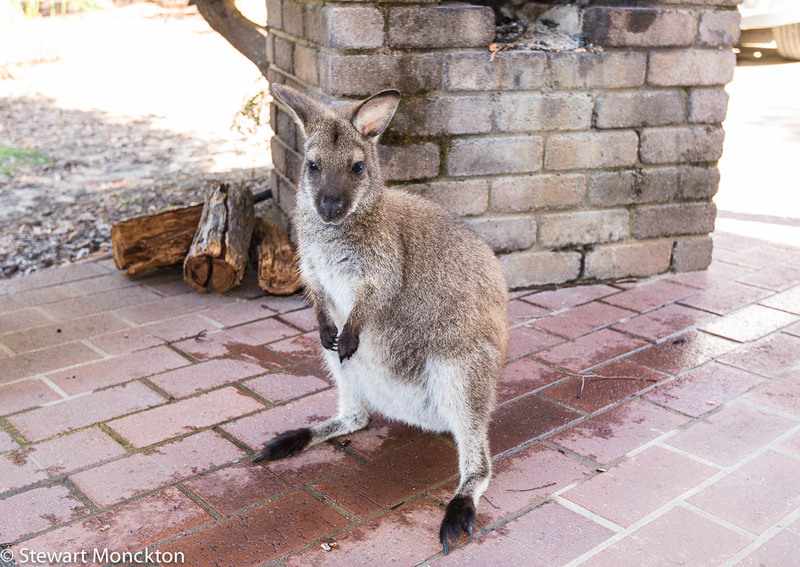 This is a Bennett's Wallaby - also known as a Red-necked Wallaby. This species was pretty common at Freycinet in Tasmania - as you can see from the ground underfoot, and the background BBQ, this was an animal that was used to human contact. In fact it looked positively disappointed when I only talked to it over breakfast, rather than offer it some toast! I think the individual was pretty much part of the house we rented! Most evenings we went for a bit of a drive or a wander looking for wildlife - the drives were more successful and much dryer! You can just about tell from the second picture that it had only just stopped raining. 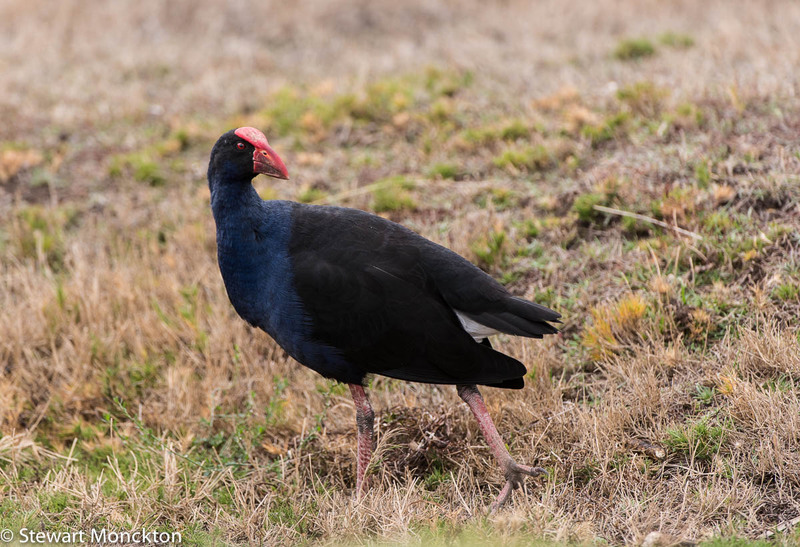 I know that I have post a few pictures of Purple Swamphens in the past, but I find them such watchable birds that I can't resist a few more pictures. These were taken on Churchill Island, which is a small island off the much larger Phillip Island, a couple of hours west of Melbourne. I took these images using the car as a hide, and this is a method I intent to use more often in the coming months. 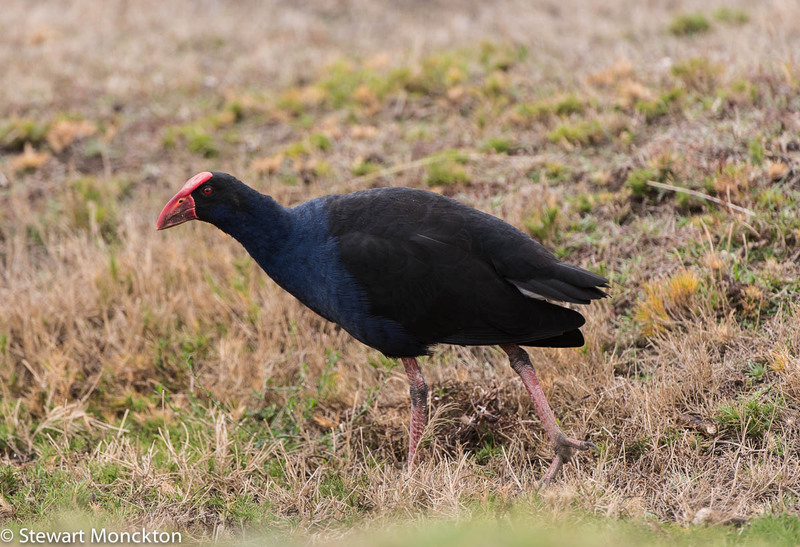 The Purple Swamphen is also known as Porphyrio porphyry, and is about 45 cm in length. Now its your turn to join in - click the blue button and off you go! 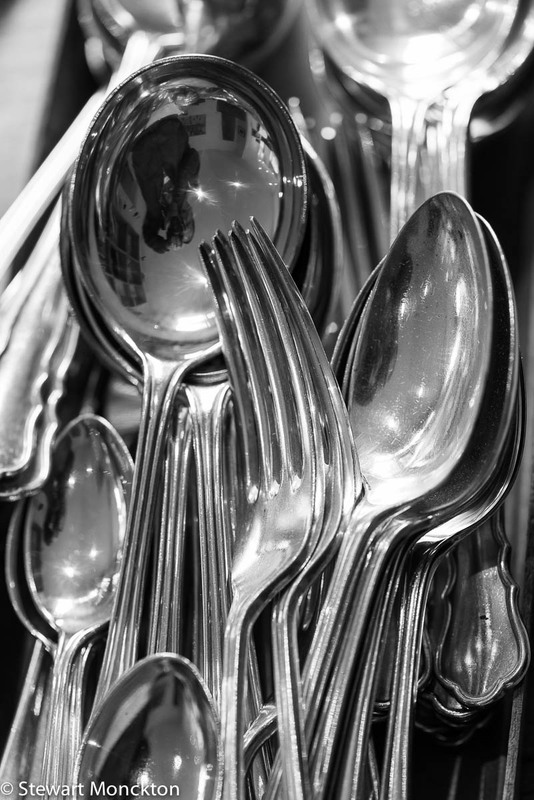 Saw these today - imperfect silver selfies. 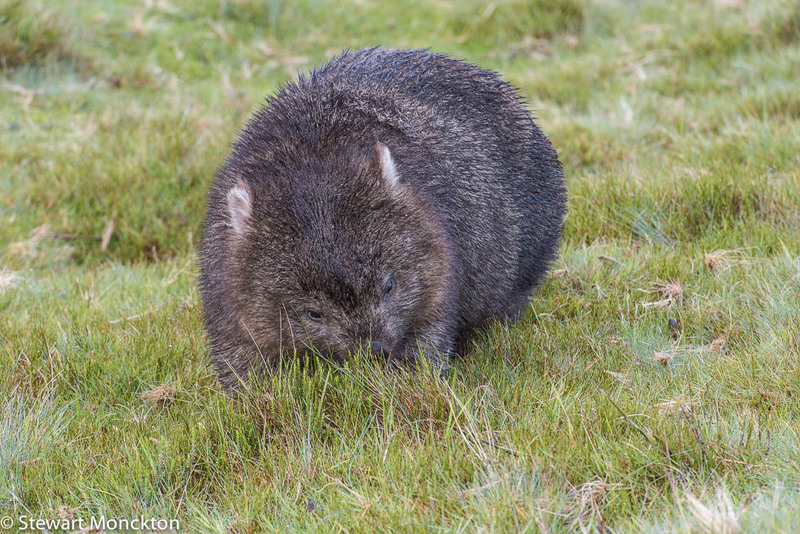 The Common Wombat is a rather splendid animal - while they are undoubtably unaware that they are the worlds largest hole dwelling herbivore, they cannot be unaware that people like standing near them! 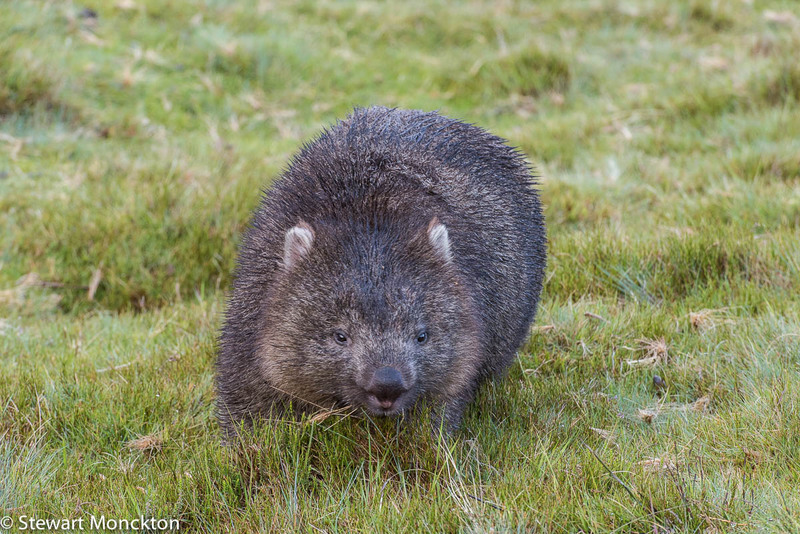 In some places you can track down a wombat on its evening wander by looking for the crowds of tourists laughing and pointing. These wombats were a little less harassed by tourists - well, until I came along. 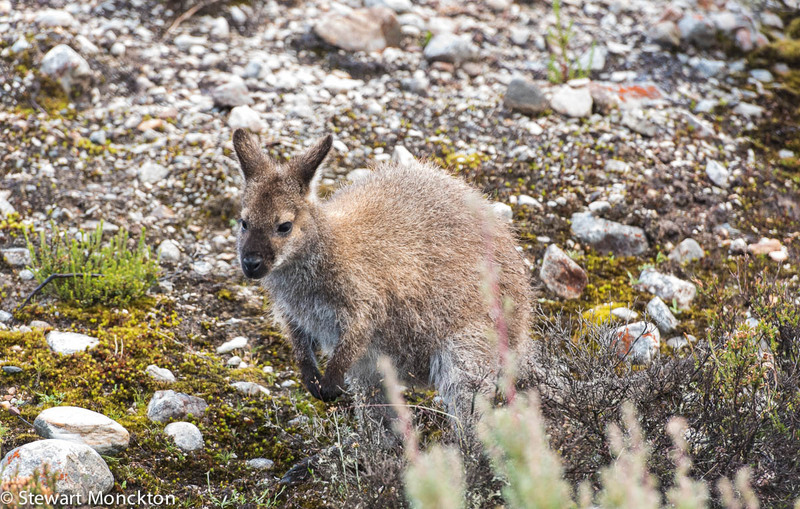 These shots are from the Cradle Mountain area of Tasmania where these chunky marsupials are pretty common. If you take a close look at these shots you can notice the amount of water on their fur - it was that kind of weather. 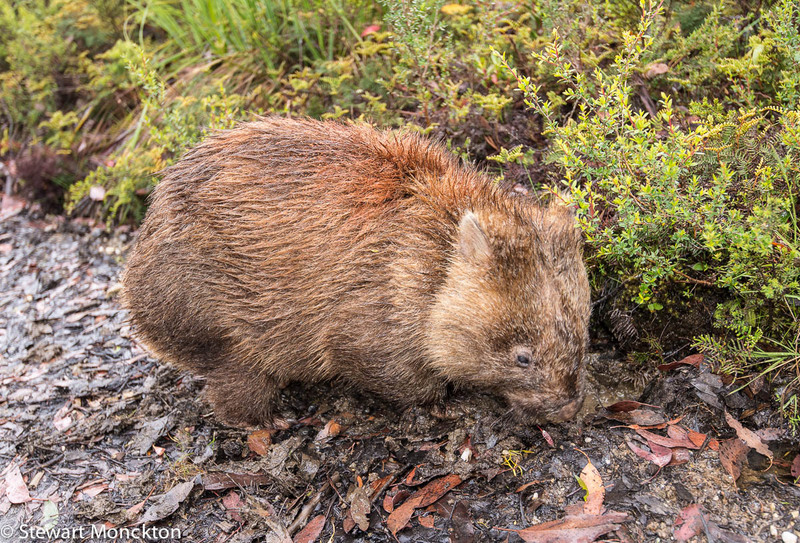 The second wombat here seems to be a red-head (red-body?) 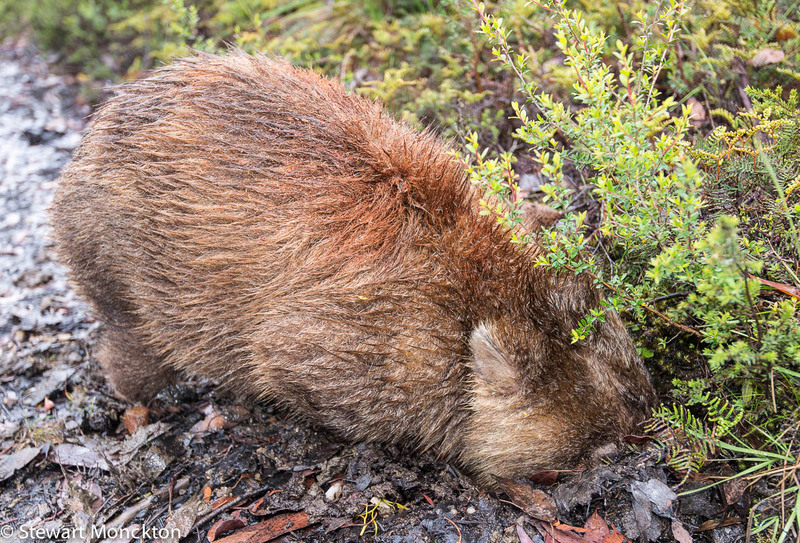 and shows that not all wombats are a bearish grey! This one was also either drinking water from a hole it had dug on the side of the road, or it was mining out some tasty roots - whatever it was doing it was making a lot of slurping noises! These animals can weigh as much as 35kg and grow to over a 1.1m in length. They are also remarkably solid. I'm not sure if its a 'trick of the light' but this second wombat does seem to have a cloudy eye, and I wonder if it is an old individual. 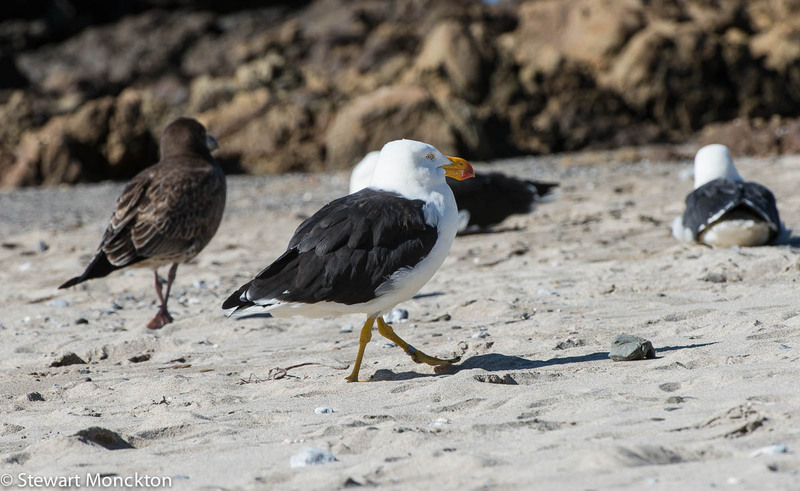 If you happen to have posted any pictures of gulls on your blog, it is more than likely that I have mentioned that we don't have many species of gulls in Australia in a comment. Back in the dim and distant past I used to try to find 'interesting' gulls in the UK - all with a consistent level of failure I must say. I still scan gull flocks here, but the chance of finding anything other than a Silver Gull (our default 'sea-gull'), a massive looking Pacific Gull or the rather restricted Kelp Gull, are pretty slim. 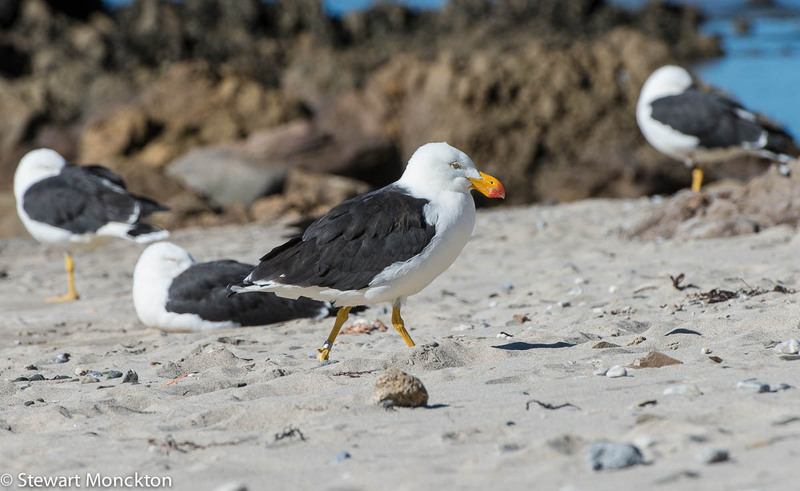 These are some shots I took of Pacific Gulls that were loafing around on the beach at Walkerville, a small seaside community about 2 1/4 hours SE of Melbourne. 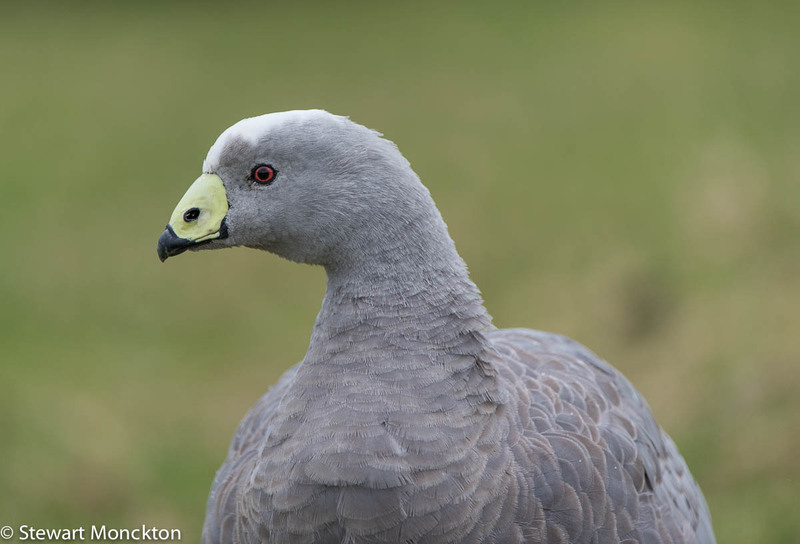 While scale is hard to judge, the size and shape of the beak gives a reasonable indication that this bird is huge. Large males can weigh over 1.5 kg and have a wingspan of almost 170 cm. 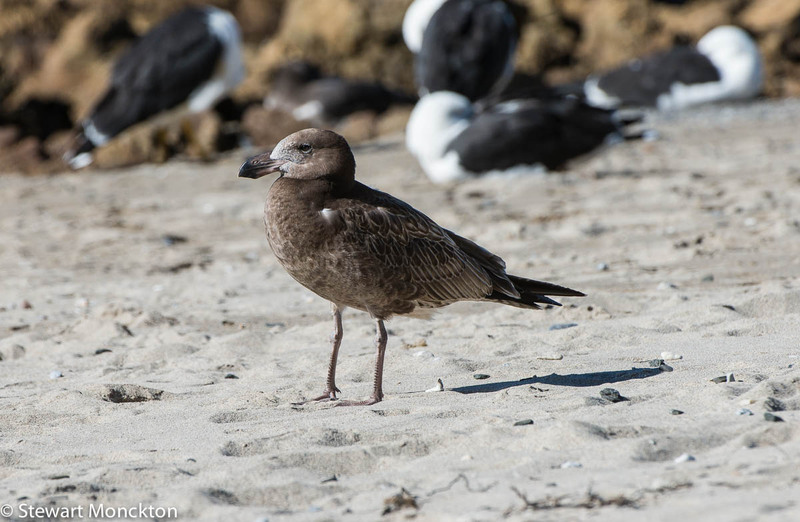 The banded birds in these shots were either banded as chicks - or by people with no regard for their own safety! 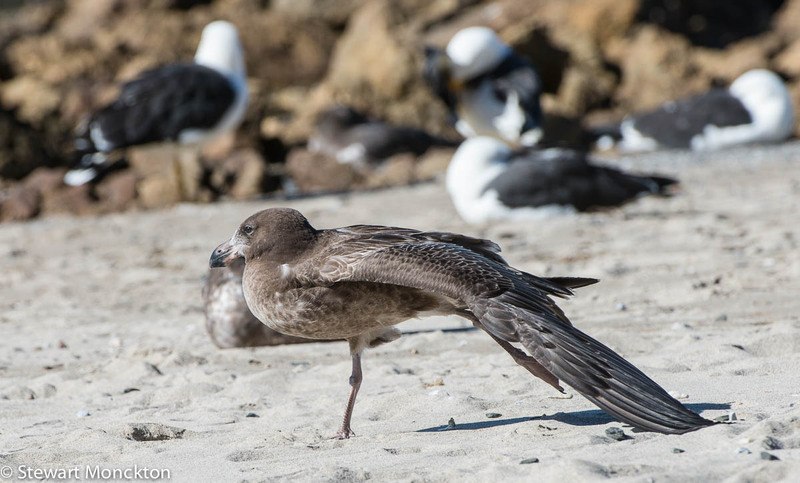 This bird is in the 'classic' gull genus - Larus - and its specific name 'pacificus' is as misleading as its common name. 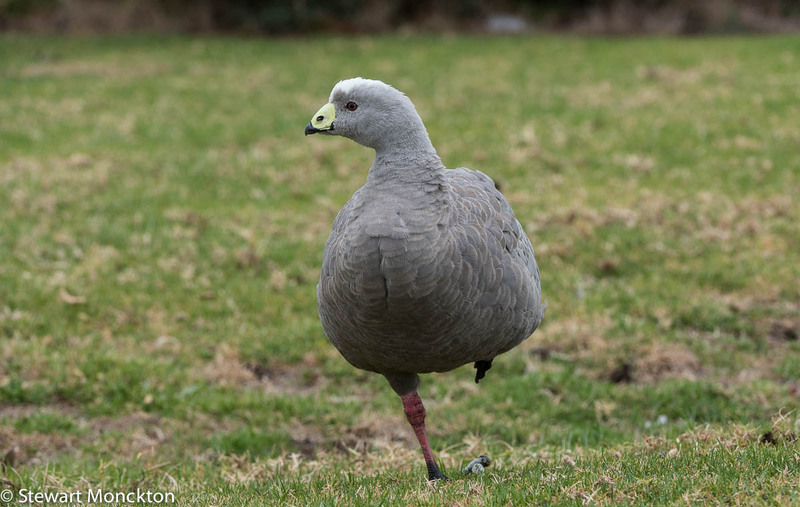 In reality this is a bird of the Southern Ocean. I rather like these birds - especially the juvenile doing a spot of yoga! Now its over to you - click the blue button and off you go. And don't forget to visit other WBWers and to leave a comment to say you visited! Cheers SM. 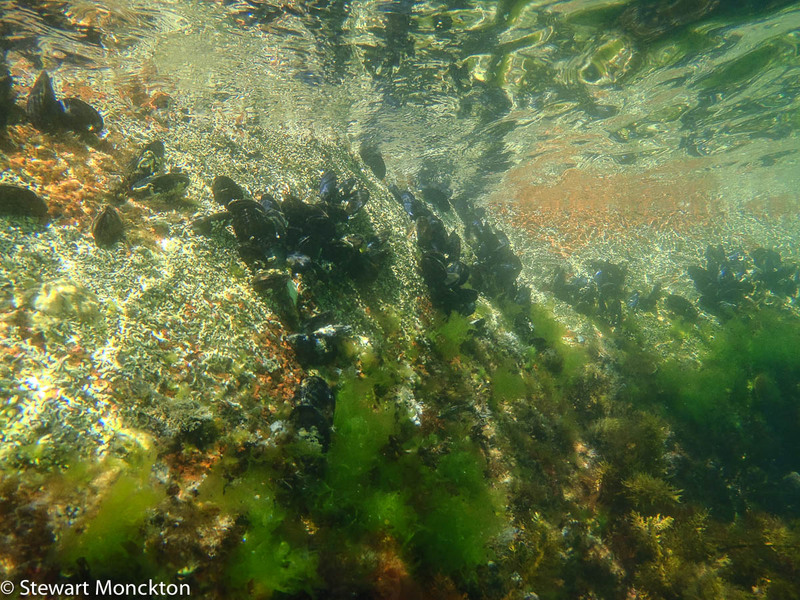 One of the things that I enjoy most about the summer, is that I can get to go snorkelling. 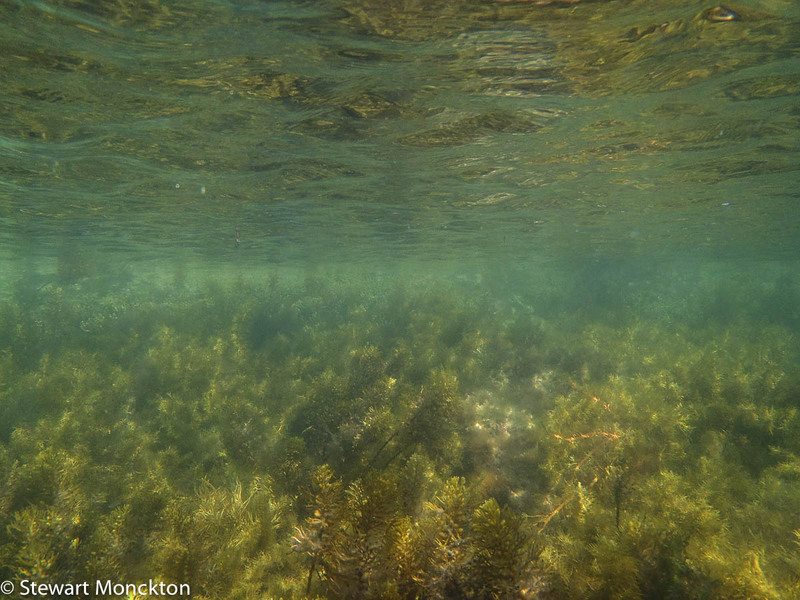 Now, we are not normally talking about coral reefs here - but even the cooler water of SE Australia can be remarkable. One day I'll get something a little more sophisticated that a waterproof point and shoot - one day! These shots are taken around Picnic Bay, nr. Coles Bay in Tasmania. 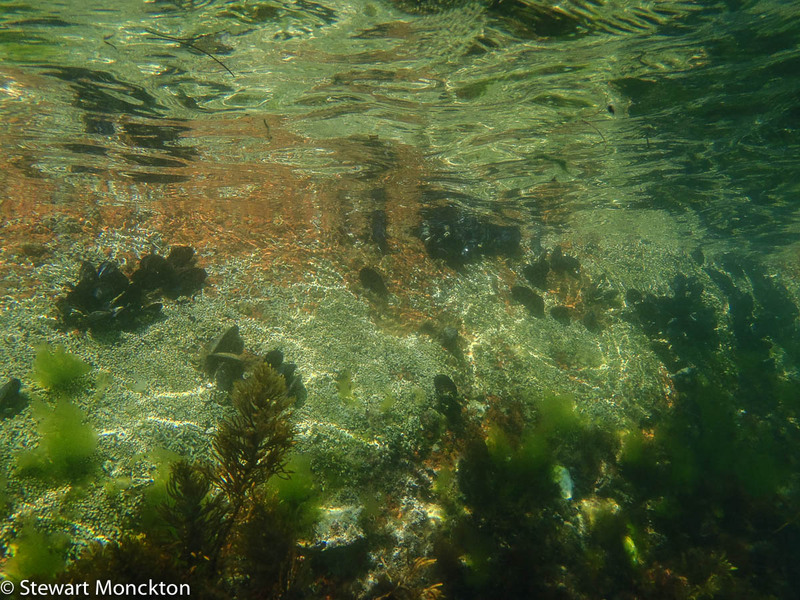 I really like the way the the water surface acts like a mirror - and if the truth be told, I'm never sure out these underwater images will turn out. 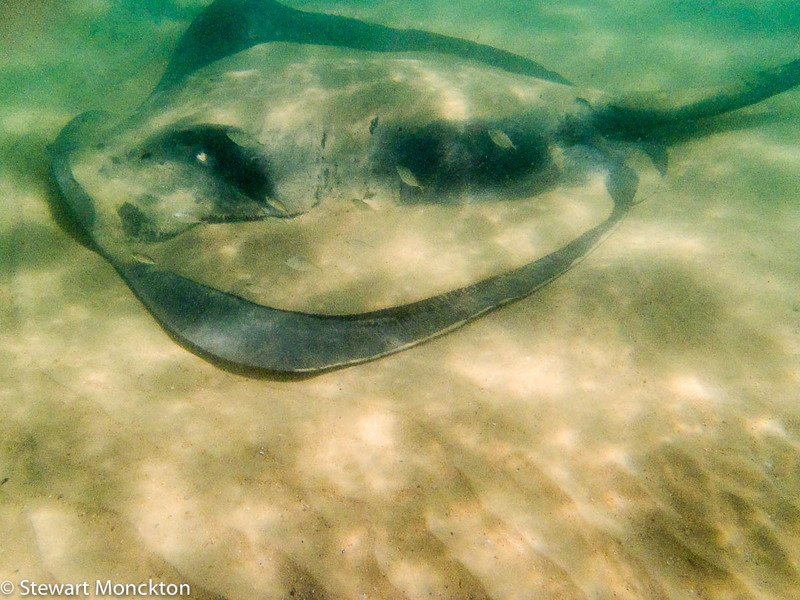 I was happily looking at the rock formations - and the muscles - when I happened upon the smooth ray. This thing is the best part of five or six feet across! I just pointed and shot! It was only when I had a look at the picture on the computer that I saw that the ray had some companion fish! I rather like that! 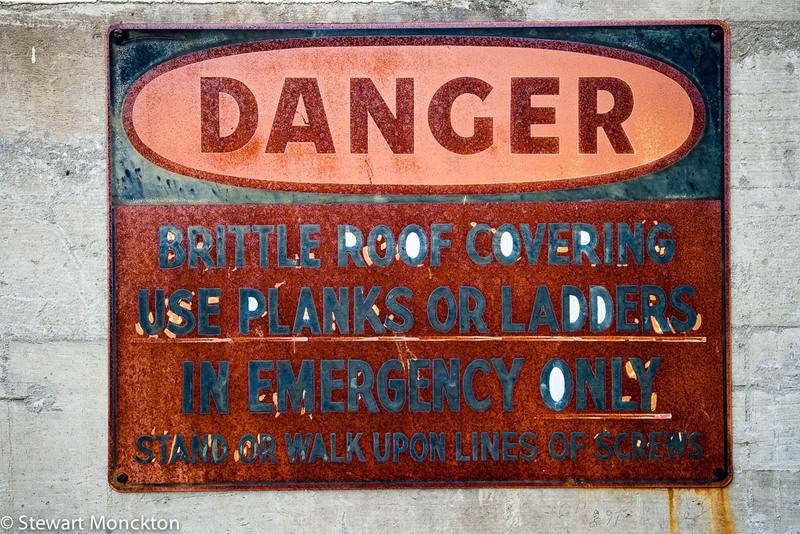 This sign was on the wall of an old tram depot in Launceston, Tasmania that has been turned into museum and gallery. I rather like the way that the white background of the sign only seems to have survived in the loops of the letters.